The next few years will see a massive shift of ads and attention from TV to mobile. A handful of companies, led by Facebook, are poised to make a killing. In a way, the story is as simple as two fractions. U.S. consumers are spending one-fourth of their media time on mobile devices. Advertisers are only spending one-eighth of their dollars on mobile. That gap between mobile attention and mobile advertising is worth more than $20 billion a year, and it’s closing fast. Mobile is eating media, and Facebook—which controls 20 percent of the mobile ad market and is growing three times faster than the leader Google—is poised to eat mobile. This is the short version. But to appreciate the speed with which the Facebook Future is here, just go back a few years. In June 2010, the superstar Internet analyst Mary Meeker delivered a slideshow presentation on the state of the Internet, the 10th version of a precis she’d prepared annually since 2001. Among her many observations, two have turned out to be particularly prescient. First, she named 2012 as a coming inflection point, when smartphone sales would overtake those of personal computers. After the moment, mobile would become the future for both audiences and advertisers. Second, she pointed to a relatively young upstart that could challenge several tech incumbents, such as Google and Microsoft. Facebook, a private company that was already the world's largest social network "in English-speaking countries," had at the time amassed an impressive 500 million annual visitors. However, the social network hadn't quite learned how to effectively monetize these people, or their zillions of "likes." Meeker saw advertising potential that might rival television. With more than 4 million “likes” each for brands such as Starbucks, Coca-Cola, and Oreos, this was the audience equivalent of TV shows like Scrubs or Parks and Recreation. In 2012, the year of Facebook’s public offering and the year Meeker had pegged as the mobile tipping point, she reported that just 1 percent of all U.S. advertising dollars went to mobile. Companies spent 25 times more on print advertising, despite the fact that print was, by this measure, a smaller market for Americans’ scarce attention. The story was easily summarized in this, the mother of all media charts (MOAMC). Yesterday, Meeker delivered her 16th annual State of the Internet presentation, updating the MOAMC. What’s changed in the last five years? Briefly, mobile is winning. Print advertising has sadly continued to crumble. Time spent on radio and television has fallen a combined nine points, and even Internet (i.e. desktop Internet) has flatlined. To see the shift more clearly, I made a third chart isolating the percentage-point change in media usage and ad spending. The entire growth of American media right now is happening on mobile devices. Mobile is unique in this picture, for several reasons. First it is a platform of platforms, providing a home for print publishers, radio podcasters, television producers, and websites in a way that no other category can be universally accommodating. Second mobile advertising is attaching itself uniquely to networks rather than broadcasts. Young people are turning away from the paid TV bundle, where businesses amplify monthly cable fees with tens of billions of dollars of ads. The most popular replacements, like Netflix, HBO Now, and Amazon Prime, are, for now, pure subscription services. If television advertising doesn’t transfer to mobile, then where is mobile advertising going to go? A lot of it will continue to go to Google and YouTube, where users watch hundreds of millions of hours of video each day; YouTube ad revenue has buoyed Google earnings. But the lion’s share is going to video that flows through social networks, like Facebook and Snapchat. “The only thing that keeps people coming back to apps in great enough numbers over time to make real money is the presence of other people,” John Herrman wrote, paraphrasing “someone who works on one of those half-dozen or so apps that we tend to associate with teenagers.” Media advertising will flow to communications services, where people can be both watcher and talker, consumer and participant. Facebook seems to be embracing the inevitable migration of television advertising to mobile by remaking itself as a social video network. The company seems to have purposefully shifted toward video, even paying publishers to make content for Facebook Live. "The increased attention on these videos mean that there’s less room to show everything in the news feed,” NewsWhip concluded. Perhaps as a result, the top 10 news sites on Facebook, including BuzzFeed, The New York Times, and the BBC, saw a 55 percent decline in likes on Facebook between July 2015 and April 2016 and a 64 percent drop in comments, according to NewsWhip. In the second half of the 20th century, the center of gravity in news media moved from newspapers and magazines to television. Facebook appears to be retracing this transition within a few months. What Meeker saw long before Facebook had figured a lot of this out is that Facebook would figure a lot of this out. They had built an interconnected audience of users who freely expressed their affinities and relationships in numbers that rivaled popular television shows. But whereas television advertisers have to assume that the demographic watching Parks and Recreation might also be interested in Coca-Cola, Facebook had a record of millions of people who like Coke, whose friends like Coke, and who are similar to people whose friends like Coke. For all the semi-annual freak-outs about Facebook's declining usage and engagement, it remains by far the most popular app among young people. More than 90 percent of 18-to-34-year-olds are on Facebook and the average user spends more than 1,000 minutes on the app each month, or more than half an hour each day of the week. The second most popular product by reach is Instagram, which Facebook owns. But the second most popular app by usage time is Snapchat. Snapchat does not have Facebook’s global scale or its sophisticated advertising business, but it might end up being the company’s chief competitor in the valuable space of social video. In four years, the messaging and video app has amassed 150 million daily users, which is more than Twitter, according to a report from Bloomberg. While companies like Twitter have struggled to grow beyond their core product, Snapchat has added features like Stories and Lenses, which slip into the golden category of being both new and intuitive. In 2015, Snapchat users shared almost as many photos as Zuckerberg's entire suite of apps, including Facebook, Messenger, Instagram, and WhatsApp, according to Meeker. If the future of media is social video networks, Snapchat is beautifully positioned to compete in it. 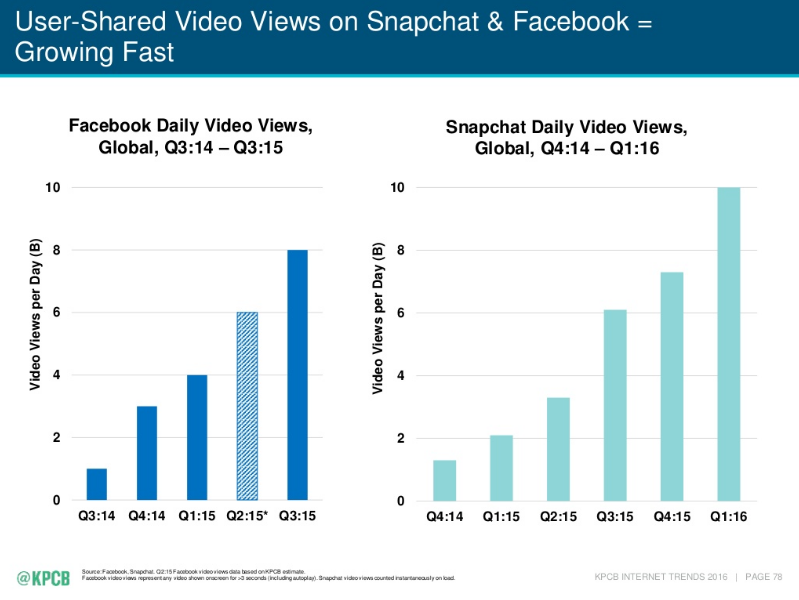 Between 2014 and 2015, Facebook's global daily video views doubled from 4 to 8 billion. In the last year Snapchat daily views quintupled from 2 to 10 billion. As attention and advertising continue their migration from cable television networks to social video networks, it’s not old-fashioned broadcasters who stand to benefit most, but rather networks like Facebook’s suite and Snapchat, where users are gleefully adrift in a messy mixture of gossip, news, and entertainment.